You just can’t make this stuff up!!!!! This week we have drawn the Clear Blue Sky card. What is really funny about that is that Dale and I were in the Apple store yesterday, deciding about purchasing a new computer for him. He just wasn’t sure so I pulled out my iphone and opened the Voice of the Soul app. I handed it to Dale and he drew the Clear Blue Sky card! Here it is a day later and I am setting up MY new computer ( I was caught up in the moment) and I shuffled my physical deck of cards and drew the Clear Blue Sky again!!!! What that means is that we are BOTH thinking clearly about these purchases. Seems like a lot of money to spend right now but our computers were old and slow compared to these wonderful new ones. I make my living by working as fast as I can and this new computer is SO much faster! I can be much much more productive. 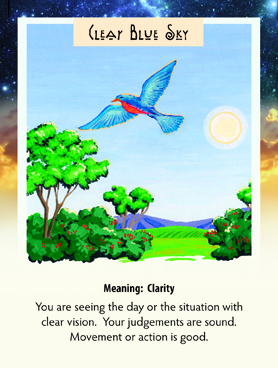 This just affirms to me what a valuable tool these cards can be in helping you make decisions. It isn’t that you are giving control of your life over to someone or something else, you are just using them to confirm what you already feel/know in your guts! So everyone, have a great week of clear thinking and KNOWING that your thoughts are correct!